We have split our delivery charges into four separate zones to make the whole buying process easier for you. 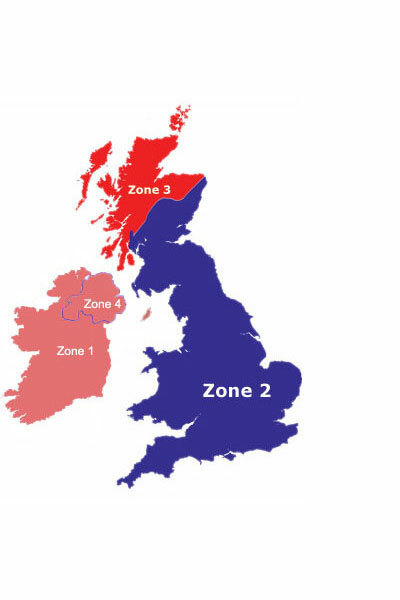 Within Zone 2 all orders over £10.00 before VAT are free, otherwise there is a charge of £2.49 plus VAT. Unfortunately customers outside of Zone 2 do not qualify for free delivery. Please Note AB post codes are covered for the free delivery. However if are outside of Zone 2 and your purchase is under 1.5 KG in weight, please ring as we may be able to reduce the delivery charge, by sending via Royal Mail instead of a courier service. We apologise for any inconvenience this may cause.